Manual therapy can form an important instrument of the physiotherapy tool kit when managing patients with neck pain disorders. Although rare, the risk of catastrophic adverse effects has been associated with manual therapy of the cervical spine. The most serious associated adverse events include cervical artery dissection (CAD) and vertebrobasilar insufficiency (VBI), both of which can lead to stroke. The purpose of this Australian Physiotherapy Association (APA) clinical guide is to assist physiotherapists to practice safe manual therapy within the cervical spine region with the awareness and knowledge to be able to manage the risks and recognise early warning signs of adverse events. 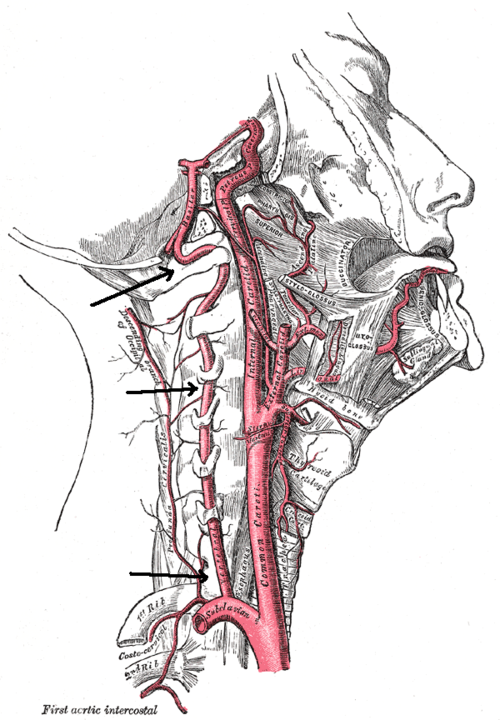 The guide is divided in two parts - vascular considerations and high velocity manipulation techniques. CAD describes a tear, that can vary in severity, in the arterial wall of a main vessel that supplies blood to the brain. It is more common for CAD to effect the vertebral artery rather than the internal carotid however dissection in either can be fatal. Blood clots are often dislodged and travel to the brain causing cerebrovascular blockage. Patient risk is increased with recent minor trauma, infection, genetic factors, migraine and cardiovascular risk factors. The patient demographic is usually under 55 years old and the pain pattern is a sudden onset of moderate to severe pain that does not subside. Therapists should be aware and ask patients about recent exposure to minor trauma (such as neck sprains or sporting injuries), recent unfamiliar neurological symptoms or recent infections. Positional testing can be performed to ascertain whether the patient is suspected to have VBI. If testing is positive, best practice is to treat within a range that does not provoke symptoms and avoid end of range neck positions during any therapy or exercises. Learn how to test - Vertebral Artery Testing. The vascular considerations component of the clinical guide is summarised in the flow chart below defining the process of recognition and the optimal action plan if you suspect CAD or VBI in your patient. These figures have been taken directly from the APA website. The APA website is a great resource for all physiotherapists. This guide can be found on their website outlining the safe manual therapy practice when treating neck disorders. High velocity manipulation techniques (HVMT) have proven efficacy in the management of some patients with neck pain disorders. Regardless of the potential positive impact for the patient, it is imperative to be able to recognise situations where HVMT is contraindicated or puts the patient at risk. As a clinician it is within our scope to practice at a level of risk if the practice is justified by current evidence, can be clinically reasoned and patient has provided their informed consent. Gross A, Langevin P, Burnie SJ, Bédard-Brochu MS, Empey B, Dugas E, Faber-Dobrescu M, Andres C, Graham N, Goldsmith CH, Brønfort G, Hoving JL, LeBlanc F. (2015). Manipulation and mobilisation for neck pain contrasted against an inactive control or another active treatment. Cochrane Database Syst Rev. 2015 Sep 23;(9):CD004249. doi:10.1002/14651858.CD004249.pub4. Miller J, Gross A, D'Sylva J, Burnie SJ, Goldsmith CH, Graham N, Haines T, Brønfort G, Hoving JL. (2010). Manual therapy and exercise for neck pain: A systematic review. Manual Therapy 2010 Jun 1. Gross A, Miller J, D'Sylva J, Burnie SJ, Goldsmith CH, Graham N, Haines T, Brønfort G, Hoving JL (2010). Manipulation or mobilisation for neck pain: a Cochrane Review. . Manual Therapy Aug;15(4):315-33. doi: 10.1016/j.math.2010.04.002. Epub 2010 May 26. Dunning et al. (2016). Upper cervical and upper thoracic manipulation versus mobilization and exercise in patients with cervicogenic headache: a multi-center randomized clinical trial. BMC Musculoskeletal Disorders 17:64. DOI 10.1186/s12891-016-0912-3. Sizer PS, Brismée JM, Cook C. Medical Screening for Red Flags in the Diagnosis and Management of Musculoskeletal Spine Pain. Pain Practice. 2007;7(1):53-71. Stiell IG, Clement CM, McKnight RD, et al. The Canadian C-Spine Rule versus the NEXUS Low-Risk Criteria in Patients with Trauma. New England Journal of Medicine. 2003;349(26):2510-2518. The Physiopedia team acknowledge the Australian Physiotherapy Association and specifically the authors of this guide: Dr Lucy Thomas, Dr Debra Shirley & Professor Darren Rivett. Written permission has been received to reproduce this material. ↑ Jull, Gwendolen A., Sterling, Michele, Falla, Deborah, Treleaven, Juliaand O'Leary, Shaun(2008).Whiplash, headache, and neck pain: Research-based directions for physical therapies.1st ed.Edinburgh : Churchill Livingstone:Elseiver Limited. ↑ Rushton A, Rivett D, Carlesso L, Flynn T, Hing W, Kerry R. 2012. International Framework for Examination of the Cervical Region for potential of Cervical Arterial Dysfunction prior to Orthopaedic Manual Therapy Intervention. ↑ Treleaven J. 2017. Dizziness, Unsteadiness, Visual Disturbances, and Sensorimotor Control in Traumatic Neck Pain. Journal of Orthopedic Sports Physical Therapy. Jul;47(7):492-502. doi: 10.2519/jospt.2017.7052. Epub 2017 Jun 16.